LEN - www.lankaenews.com | Dollar appreciation galvanizes govt. 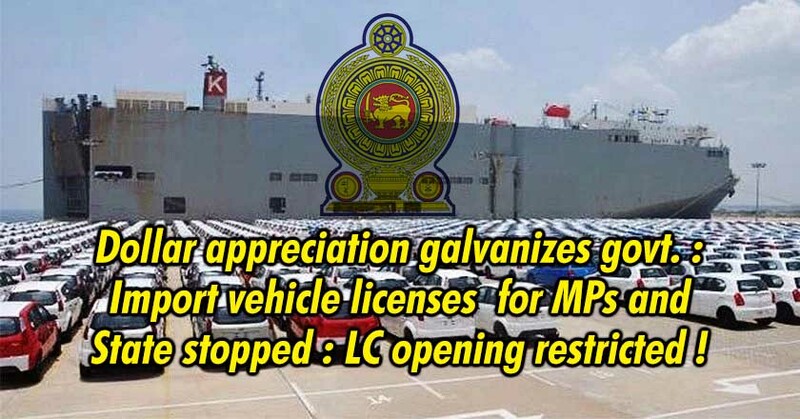 : Import vehicle licenses for MPs and State stopped : LC opening restricted ! It is to be noted not only SL , several other countries too are affected by this crisis . Importation of vehicles for Government Ministries, Departments, Statutory Boards, State own Enterprises will be suspended until further notice. Importation of vehicle using the concessionary permits issued to entitled State Sector employees will be suspended for six months. No Letters of Credits will be permitted to be opened based on these permits during this period. Loan to Value Ratio (LTV) for Hybrid vehicles will be revised from 70:30 to 50:50 basis.